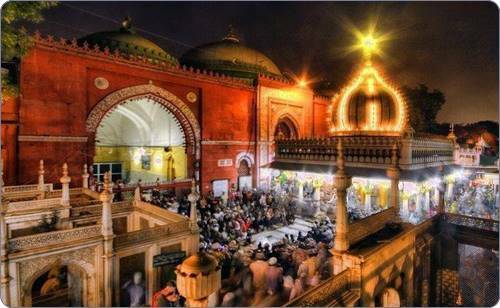 Urs Mubarak of Hazrat Nizamuddin Auliya Mahbub-e-Ilahi R.A. I have given my life to you, oh my beloved cloth-dyer! You’ve dyed me in yourself, by just a glance of yours. These verses of love by Hazrat Amir Khusrow for his peer o murshid Hazrat Nizamuddin Awliyah R.A. remains an ultimate tribute to one of the most influential Sufi saints ever. Hazrat Amir Khusrow adopted a unique style to express his love, which often sound like yearning of a woman as it depicts a feminine voice. Allama Iqbal had great reverence for Hazrat Nizamuddin Awliyah, which is reflected in his poem Iltiaja-e-Musafi [Mehboob e Ilahi Ki Dargah Pe]. Before saying farewell to India to pursue his higher studies, Allama went to Nazar of Nizamuddin Awliyah for his fatiha.